Building & Construction Codes: Codebooks for International, State, Uniform & California Regulations...Click here for more information. Everything in our Canoga Park store and in this online store is priced at 10% off the Publisher's List Price. We've made ordering fast and easy, too. 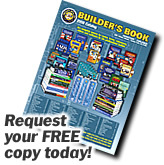 So, it just makes sense to make www.buildersbook.com the first place you go for the information you need. Designing and installing code-approved plumbing is important -- even a small mistake can be costly. With the Illustrated Guide to the International Plumbing & Fuel Gas Codes you�ll learn from a nationally-recognized code expert what compliance issues you�ll face on the job, and learn what the codes require when you design, install, or work on plumbing or gas piping systems. Learn the art of professional roof framing with master framer Steve Peters, from Southern California. Steve clearly demonstrates the measuring, cutting and assembling of each roof design. Entire process, with complete details..From Start to Finish! Video: The Truth About Mold! In this video experts in the field will cover: Investigating an actual home, inspecting for mold, red flags, testing procedures, evaluation, Lab, and remediation. Learn the art of professional roof framing with master framer Steve Peters, from Southern California. Your Contractor's License & Real Estate License Source. All of their products and services are guaranteed to get you the results you need. Practice Exams/Bonds and More! This book puts two decades of problem-avoiding expertise in residential construction between two covers. 17+ years of JLC from Jan 1986 through the current issue. Perfect for jobsite troubleshooting, skills training, even dispute resolution.